Lately I’ve been experiencing something that doesn’t seem to make sense. When I run after a taking a day or two off, I feel bad. It feels like my legs have forgotten how to work. It feels like I have to focus to get them moving properly. On the other hand, I feel much better on the second or third straight day of running. Today was a great example. I felt better today than I did yesterday. And yesterday I felt better than I did the day before (which was my first run after a few days off). I guess there’s some logic behind that. I just don’t know what it is. Right now I’m enjoying the easy paced, longer runs. Will keep doing them until they get boring or I start itching for something faster. Beautiful days since the crazy snowstorm. Most of the snow has melted. 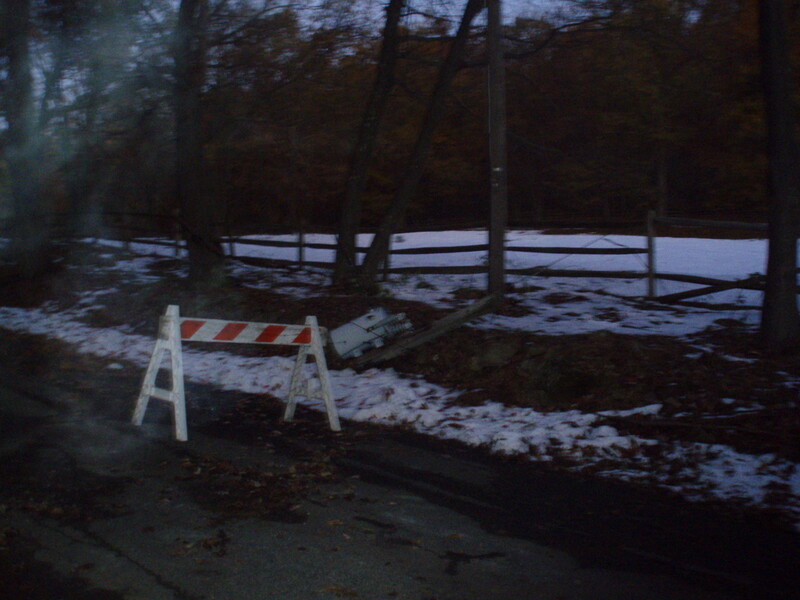 The only remnants of the storm now are the snow piles left by plows or snowblowers. And the down trees. I still hear the drone of generators as I pass by some areas. Two businesses the storm may have helped? Starbucks: The only place in town that offered the two modern day human needs—hot coffee and wifi. Gas companies: Most generators run on gas. Lines at gas stations have been ridiculous, and I saw people buying multiple huge gas cans as late as yesterday. The NBA Network has resorted to showing Hoosiers tonight. Great movie, but I’m sure the big wigs would rather be showing live basketball. I abandoned the nutrition experiment a few days ago. 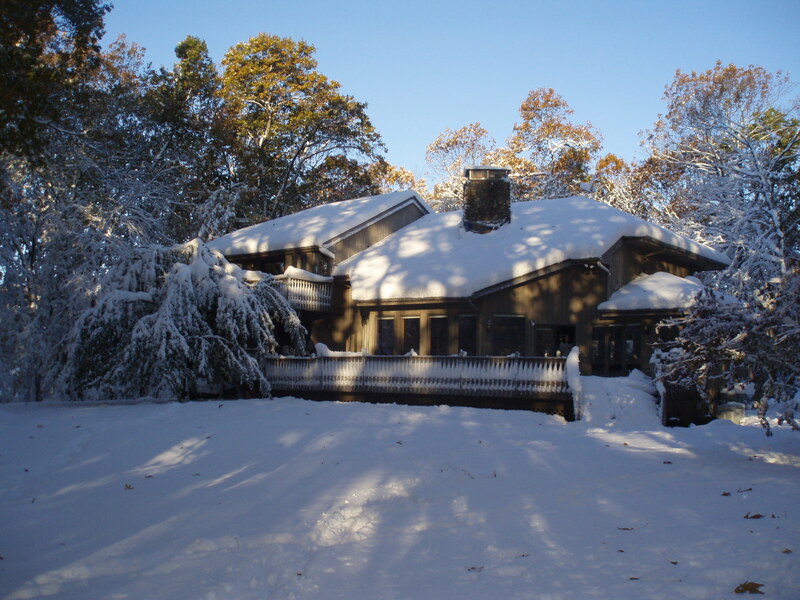 Here are some pictures from the October snow we recently experienced. Above: a view from our front porch. That tree on the upper left is a river birch…it should be straight. Above is a view of our driveway during the storm. 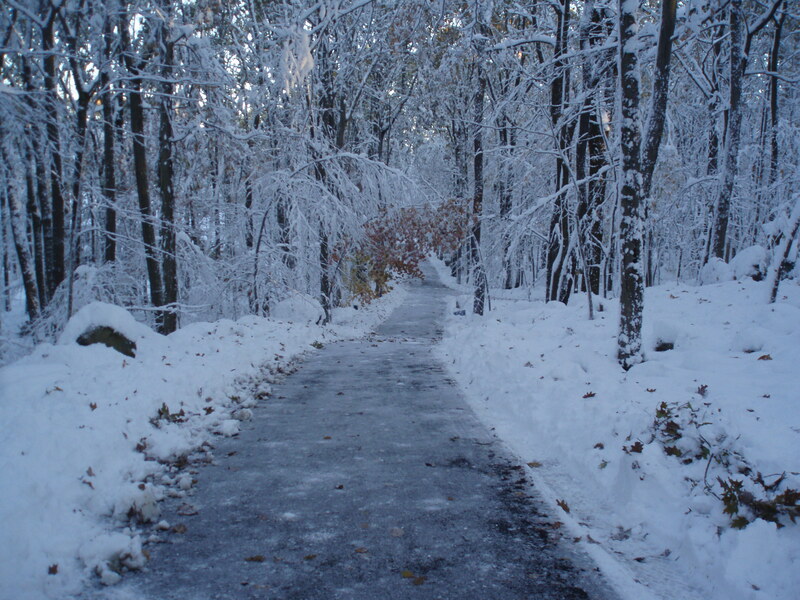 Below is the driveway after the storm. Notice the one tree below with no snow? That’s the one I kept having to knock the snow off. It’s not there any more; I cut it down already. 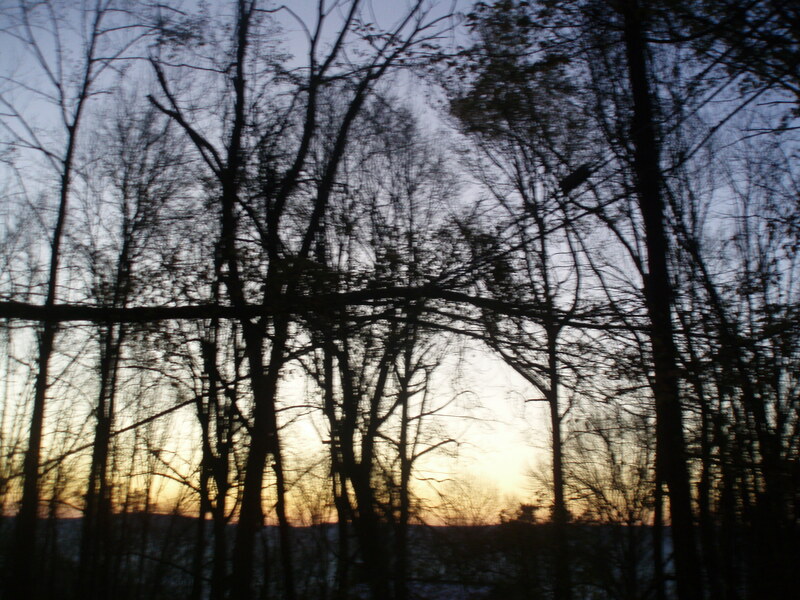 Below…morning in the land of the bent trees. The back of the house, during and after the storm. 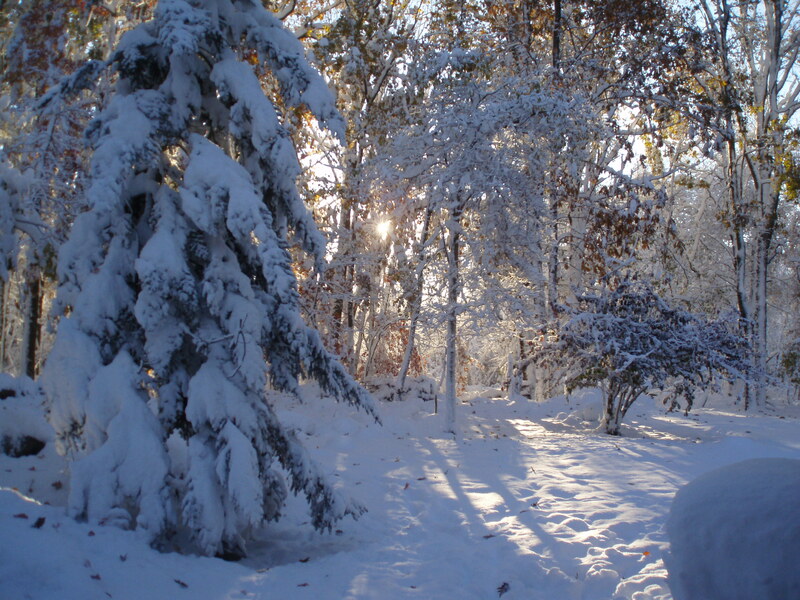 In the “After” picture, you can see that the sun has already started melting the snow at the treetops. There is no snow at the tops of the trees, but still a ton below. Still some strange things happening. School is still closed. Roads are still closed. About 2,000 people don’t have power yet. Four “snow” days used already this year, and November just started. Yesterday I heard someone say that was the full allotment of snow days for the year. The kids will be going to school in July. I’ve got to say I’m confused and a bit frustrated. I know these storms supposedly don’t come along very often, but we had one 3 years ago almost exactly to the day. The power was out for a week just like this time. This time may have even been worse. Same with Irene a couple months ago. It’s impossible to understand how something like this could impact us so heavily. I don’t know who to call to the carpet on this. Probably everyone. Government. For spending billions of dollars of “stimulus” money to repair the “infrastructure” without fixing problems like this. If power and phone aren’t infrastructure, then what is? I’ve seen the same highway re-paved every single summer. When will government figure out how to spend money on the right stuff? I don’t pretend to know how it all works. I just wish we could have a better, more transparent way of figuring out what to spend the money on. Power company. Has a virtual monopoly in our area. Why would they spend money to upgrade their system or prevent these things from happening? They have no incentive. They can’t even gather accurate information regarding who has power and who doesn’t. Me. Didn’t take enough action at the local level. It’s easy to sit on the sidelines and say that I can’t have influence. And nationally I think that’s probably true. But I can have an influence on the local level. I can get out to township committee meetings where they decide what projects to do and how to spend our tax money. I can demand some sort of transparency and accounting for the response. I can at least make my voice heard. 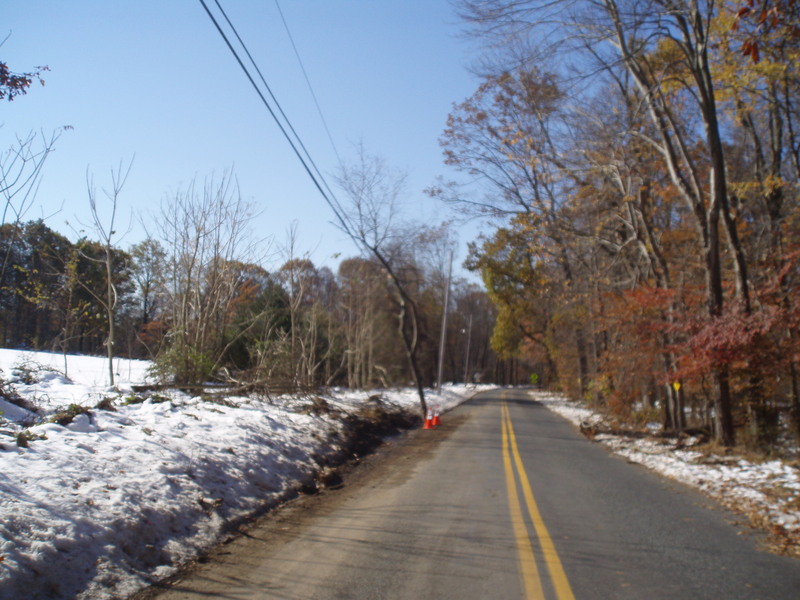 Here are a few scenes that are repeated countless times even today, 4 days after the storm. I understand that there are priorities, but why is a tree company cutting branches on my street where the power lines are fine as opposed to here, where there is a much more urgent need? My guess is that the people running the operation don’t have all the information they need. Things like preparedness for and response to emergencies like this are complicated problems. The power grid is complicated. I get it. I’m just really tired of seeing storms like this hit our area with absolutely no improvement in how we handle them. We’re not any more prepared. We’re not any better at responding. I don’t think the finger can be pointed anywhere specifically—we’re all accountable. Perhaps a starting point is just seeing if we can get more transparency into the process. What happened, what information was known and not known, what are the priorities to fix so this doesn’t keep happening. And the powers that be could stand to be a bit more creative too, like enlisting some locals to help in some way, shape or form. With all kinds of social media available and mobile access (the only thing that worked reliably the past few days), we should be able to gather better information and deal with these kinds of issues more swiftly. We should also be allowing locals to cut trees that are down in areas where there is no risk. They would love to have the wood and it would get things up and running much more quickly. I think a better dialogue between the people, the town and the power company would really help. I love snow in the winter. The more the better. If we’re going to get it, I’d rather have the big storm than the small nuisance. It’s fun to be snowed in, knowing you don’t have anywhere to go. In autumn, snow isn’t as much fun. It’s wet and heavy, making it double trouble for trees that haven’t shed all their leaves. 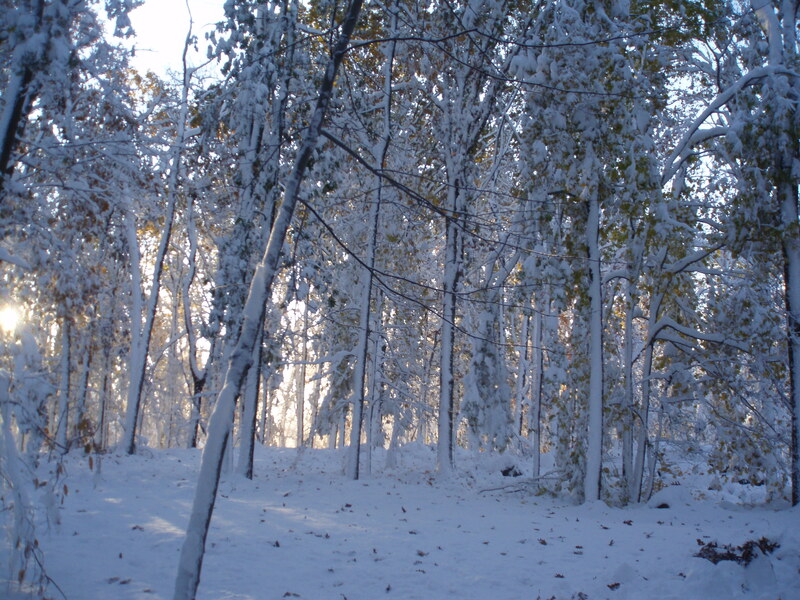 When it snows in autumn, the trees bend to the ground. Note to self: cut down all trees within “bending” distance of the driveway. Our house sits on a “flag lot,” which is a property with a long driveway and a house at the end of it (kinda like a flag). It’s impossible to shovel or snowblow. We need a snowplow. Trees that bend over the driveway make it impossible for the plow to make it up our driveway. This Saturday we got about 14 inches of snow…argh. So on days like Saturday, every few hours I go out to knock snow off the trees so they can straighten up, allowing our snow plow guy to clear the driveway. Tip: If you do this, don’t look up after you’ve hit the tree. You end up with a face full of snow. It’s always a bit dangerous. 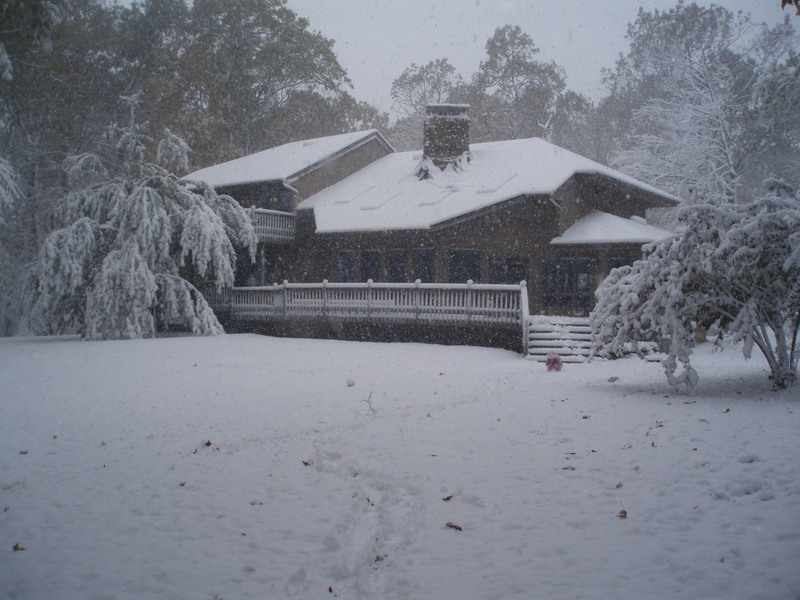 The last time we had a big October snow (2008), I managed to scratch my cornea. I shook a tree, and a branch whipped out of the snow into my eye. Not fun. The other concern is the occasional cracking sound, which is usually followed by large branches falling to the ground. Luckily, I didn’t get caught in either of those problems today. Seeing the branches bent down makes me feel like I’m in another world. Like I’ve traveled to some land in Lord of the Rings or Star Wars. It was especially nice on Saturday night. With the power out, there was just darkness. The only light and sound came from the occasional car. When a car came by, the light reflected off the branches to create a beautiful scene. I felt really peaceful out there in the snow. It doesn’t have the same feel as winter, though. It’s not nearly as cold and desolate. Beyond taking care of the trees, everything is pretty quiet. 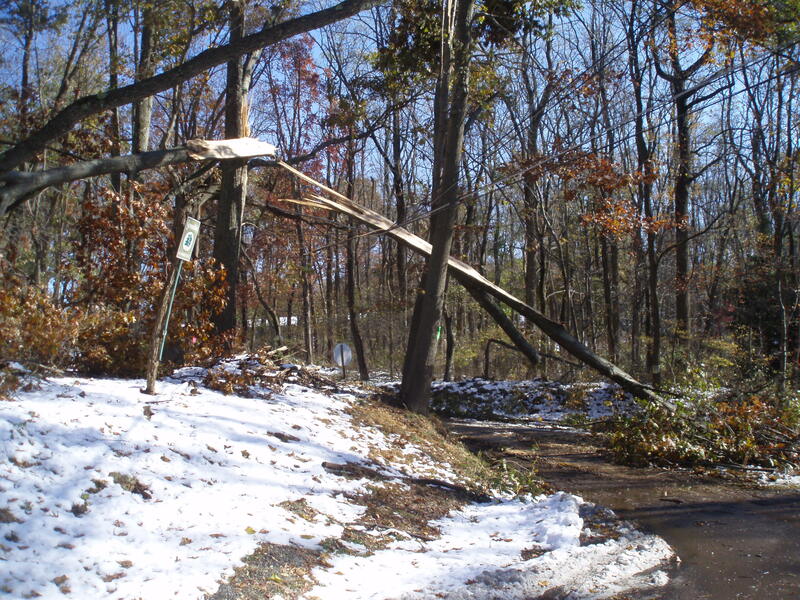 We learned our major lesson from the 2008 storm—buy a generator. Our generator is the best investment we ever made. Given the frequency of power outages where we live, the generator has already paid for itself. It allows us to have water, sufficient light, heat and some power to refrigerate stuff and cook. Enough to get us by. Found out today that the schools here are closed again on Monday. That’s the second weather related school closing this year, and we are nowhere near winter. Not a good sign. Finally…9:30 pm Sunday night…power back. Phone lines back. Not expecting power any time soon. Hope to get power back in a day or so. Will post pics then. Got a 23-miler in again today. Down the Columbia Trail to High Bridge. Beautiful day. Lately I’ve been drawn to the longer runs and rides for whatever reason. I’m enjoying the nice easy pace. I’m surprised by how dark it is in the morning. I don’t remember it being this dark in the morning in late October last year. Didn’t they recently change the date when we turned our clocks back? Maybe that has something to do with it. Snow in the forecast for tomorrow. Not just a little…6-10 inches. Snow at this time of year is a big problem. The trees still have leaves, so they catch more snow. 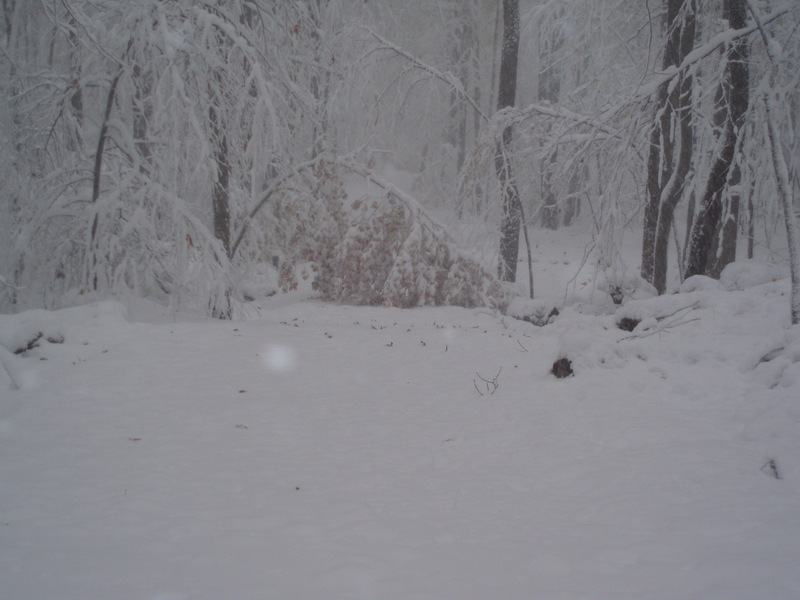 The snow is also heavier, so a lot of trees end up coming down because they can’t handle the weight of the snow. Trees coming down = power going out. 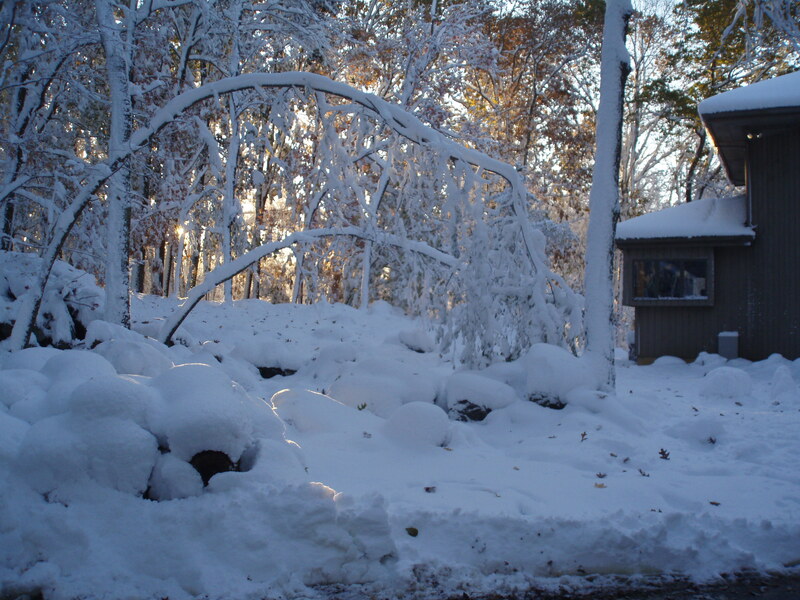 The last time we had snow in October was 2008, and that year we lost power for 4-5 days. Ugh. This year we have a generator, so we won’t have to endure 50 degree temps in the house like last time. We’ll have some light and the food in the fridge won’t go bad. Still, it’s no good when the power goes out. In fact, in 2008 we got out of Dodge…I went to my dad’s place and the wife and little girl went to her mom’s. I have vivid memories of watching the Phillies clinching the 2008 World Series from my dad’s couch. Good times. Speaking of the World Series, game 6 yesterday was one of the best games I have ever seen. It looks like the Rangers are done…too bad. I wanted those guys to win. 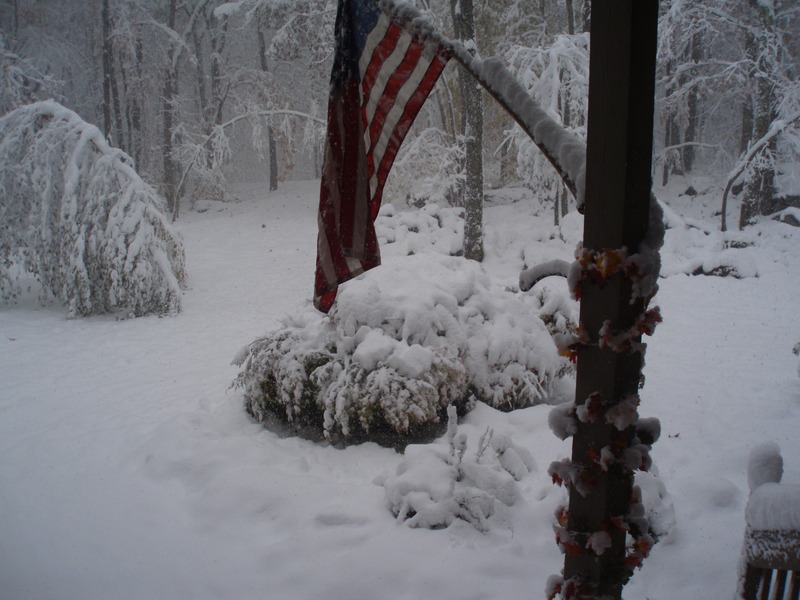 I’m searching for pictures from the 2008 October snowstorm. Will post them if I can find them. I opened the front door at 6 am and stepped into pitch black darkness. It was a familiar feeling; I’ve been a morning runner for over 10 years. This morning, however, something was different. I heard an unfamiliar, rhythmic rustling sound in the front yard. Even with dead leaves scattered everywhere, it couldn’t be the wind. Recently we’ve seen bear, fox, deer and all kinds of ground animals in our yard. I was most concerned about a bear—a bear seems to have found good breakfast in the neighborhood, and 6 am is typically the time he/she pays the neighborhood a visit. I quickly went back into the house, fumbling for the switch that controlled the outside light. After turning every light inside the house on, I finally found the outside switch. I couldn’t see anything so I retrieved a flashlight and decided to head out. I didn’t hear anything this time, so I stashed the flashlight in the mailbox, found the light on my watch and started running. I spent the next mile running in the darkness down an unlit street, hoping that I didn’t bump into anything (living or dead). Ahhh…the beauty of the morning run, especially in autumn. As my eyes started to adjust to the darkness, my other senses became active. I caught the familiar aroma of wood burning. The smell of fire burning…it’s one of the things I love most about being outside in autumn and winter. Most people in my area have wood stoves, fireplaces or outdoor fire pits so the smell of wood burning is familiar. Yet it always picks up my spirits. Maybe it brings me back to a time long past. I spent the next two hours watching the sky change: from all grey to grey / orange to orange / red / yellow. It was beautiful. Every time I looked, the sky was different—different colors, different cloud formations, different position of the sun on the horizon. I was surprised at how long the color display lasted. This morning’s run included an especially scenic stretch where I passed a nature preserve that surrounds a ravine. Just incredible to see the sun rising over the ravine. I wished I had a camera. I was thankful that the predicted rain held off. I don’t mind a rainy run in the spring or summer, but when the temperatures dip below 45 it can be really nasty. I was happy to be getting the run in before the rain came. After all, it’s Wednesday and lately Wednesday means rain around here. Sure enough, the rain started about an hour after I returned. I used to run only in the morning. I did it mostly for convenience, before the craziness of the day started. I wanted to finish my run before I got otherwise occupied. Lately I haven’t been running in the early morning. I’ve been trying to run at different times, experimenting with different ways to organize my day. This morning’s run was like slipping on an old shoe. It felt so comfortable to be out there early, before most people were awake. Just really peaceful. I realized how much I’ve missed that morning workout.